Is PlanetLotto a Scam or Legit? Read Reviews! I was looking around at some different, new lottery sites to see if anyone is offering anything new and different. 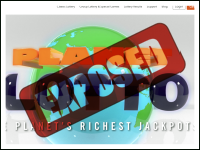 PlanetLotto.com.au is simply another online lottery provider that offers lottery tickets and group play. They try to link it into some sort of charity program, but there is not enough information for this to be credible. It made me look deeper to see what else they do offer. I’m not very impressed. This online lottery provider offers eleven international lotteries including the usual mega lotteries plus Canada’s 649, New York Lotto, La Primitiva, SuperEnalotto, BonoLoto and UK Lotto. There are no Australian lotteries. Players any amount of tickets including only one. Subscriptions are available for 2, 4, 8, 26 and 52 draws. Keep in mind, some of these lotteries are available twice a week for 52 draws is actually six months. Getting out of a subscription requires notification a minimum of five business days before the “next monthly cycle” ordered otherwise it is automatically renewed. I’m not sure how it works for a subscription of 2 draws which say for Canada’s 649 would be one week. PlanetLotto.com.au has “Group Play” available for each of the eleven lotteries. Each group has 50 lines that are randomly picked. But – yes the but – there is no information on how many shares are available for each group. I asked the question to PlanetLotto and still haven’t received an answer. One of the key aspects of playing in a syndicate is how many people you’re going to have to share your winnings. There are discounts for multiple play and it appears for each multiple play, players get a free Mega Millions ticket. PlanetLotto says that in playing here you give the company an irrevocable power of attorney to get your winnings for you. Then they say that you might have to go get it yourself and pay all costs related. Where winning is available as an annuity or lump sum, all jackpots will be taken as a lump sum. Any payment is through the same method you put the money into your account to play. There is a minimum withdrawal of €5. Payments are usually made three business days after your request. Payments are made in either Euro or US Dollars and any conversion is by the rates published by the Royal Bank of Scotland. Okay, that is weird as the company is registered and operating in Australia and to play all lotteries is in Australian dollars. PlanetLotto.com.au says there is no commission and fees on getting your winnings though there could be third party costs. PlanetLotto.com.au says anyone can play here as long as you are 18 years or older unless a different age is required by where you live. There are no other restrictions. New players get a “Welcome Bonus” of a free participation in a group play of “an International Lottery draw. Same goes for the “Tell a Friend Bonus”. PlanetLotto “aims” to give “up to” 50% of all tickets sold to Australian community fundraising groups. Click on the “Charity Lotteries” from any of the lotteries offered and the system defaults to Mega Millions. Not sure what that is all about and there is no information on their site why there is this link. If you’re in Aussie, then there is a toll free number to talk to Planet Lotto. Otherwise, there is an email address and online form. The customer service is open 9:00 am to 5:00 Australian Western Standard Time Monday to Friday. There is no information on their response time. Planet Lotto is registered to Cardinal House Group Pty. Ltd. with a snail mail address in West Australia. Ah, but looking further, it is actually owned by Safe Global Payments Limited registered in Malta. These folks have at least one other site I am aware of. Would you mind rating PlanetLotto.com.au ? This looks like a fairly straightforward lottery at the same time, the lack of response to my questions bugs me. Plus, what is with the charity aspect. Okay on top of that – why is a company in Australia using the Bank of Scotland for their official currency exchange rates. Everything is posted as purchased in Australian dollars, but the only way you get your money is through US or Euros. I’m not going to give this site a thumb’s up or thumb’s down. There is no indication that it isn’t legit at the same time there are enough questions that I’m going to stick to my familiar sites. I don’t see any reason to jump on board here.